What Makes Vietnamese Coffee So Strong? It’s been a long day. I’m unwinding in my kitchen and I need a good strong drink. 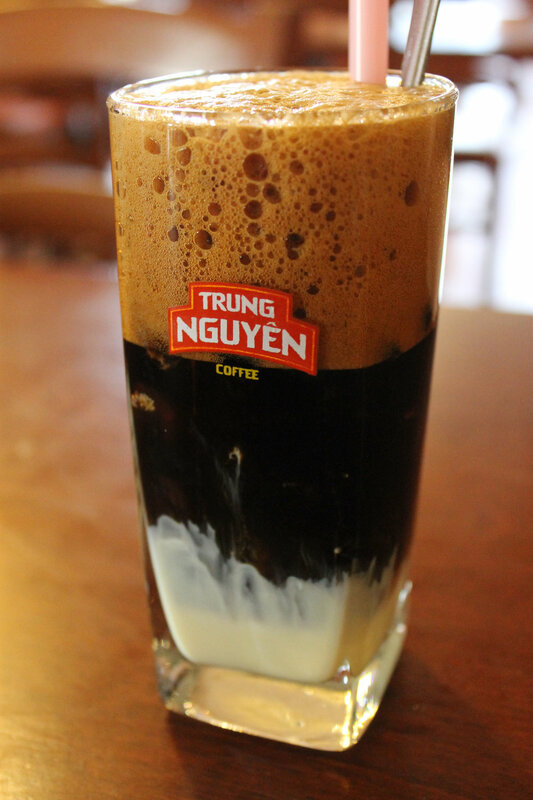 The only thing that will do for me is: a cà phê sữa đá, a super-strong cup of Vietnamese coffee filtered over ice and cut with sweet, syrupy condensed milk. Now that is how I like to unwind. Cà phê sữa đá is as Vietnamese as phở! If you grew up Vietnamese, then chances are your household would have had a phin cà phê, or coffee filter. It’s a little cup, made of cheap, metal piece with a lid and tiny holes at the bottom. It fits neatly right on top of a glass or coffee mug. I’ve already got the water boiling. First, let’s grind the coffee. This stuff has to be ground pretty coarsely, similar to French press style. You pack about one or two tablespoons tightly into the phin. That way, it won’t go through the bottom holes. Then I set my phin up over the glass and pour the water in. Cà phê sữa đá is a nice and slow process. As I sit and watch the dark liquid drip into my glass, I got to thinking: Why isn’t everyone drinking Vietnamese coffee? I call up Sarah Grant, assistant professor at California State University Fullerton. With a Ph.D. in Anthropology, she specializes in research in the Vietnamese coffee industry. “I mean, it’s mind blowing that [Việt Nam] is the second largest producer of coffee in the world, and so many people don’t know that,” says Grant. The truth is, our coffee is a lot more complex than that. Part of the reason why Vietnamese coffee isn’t well know is because it’s exported and processed into blends or cheap instant coffee. That, and the type of coffee matters too. The Western world is in love with Arabica beans and not Robusta, which is Việt Nam’s strong suit. “Việt Nam doesn’t have that branding,” says Grant. Brand or no brand, you can’t beat the deliciousness of a Vietnamese cà phê sữa đá. Robusta is what makes the coffee so strong and bitter. We are going to cut that with some nice, thick condensed milk, and ice. Now, where is a good place to enjoy a glass of cà phê sữa đá? Sarah has a suggestion. “Honestly, my favourite place to drink coffee in all of Vietnam is at this little café in Đà Lạt in the South Central highlands where I used to live for some time, it’s called Café 171. And I like to drink there really early, 4:45, 5 o’clock, and just watch everything start to wake up in Đà Lạt. You know the mist is so beautiful there and it’s always misty in the morning,” she reminisces. “So it’s just the perfect place to sit on a little wooden stool. And then the bánh bao lady usually comes by, so, that’s like a bonus,” she laughs. For me, this stool in my kitchen will have to do. Still, a sip of this coffee, there is nothing like it. Loa: a podcast that explores the ideas and stories that shape Việt Nam today. Unless otherwise stated, content on this website is licensed under a Creative Commons Attribution-NonCommercial-ShareAlike 4.0 International License.